TAPPER: Good morning and welcome to "This Week." A health care victory for the president. PRESIDENT BARACK OBAMA: Health insurance reform becomes law in the United States of America. TAPPER: While Republicans vow to overturn it in Congress or the courts. (UNKNOWN): President Obama signed away another share of Americans' freedom. TAPPER: The president says, bring it on. OBAMA: My attitude is, go for it. SEN. JOHN MCCAIN, R-ARIZ.: Right, Mr. President. We're going to go for it, and we're going to repeal this bill. TAPPER: Is this the final nail in the coffin for bipartisan cooperation in Washington? And what's next on the president's agenda? Questions for our exclusive headliner, the president's senior adviser, Valerie Jarrett. Then, states sue to block health care reform. Two key governors on opposite sides of the fight, Mississippi Republican Haley Barbour and Pennsylvania Democrat Ed Rendell, a "This Week" debate. Plus, a standoff with Israel and (inaudible). That and all the week's politics on our roundtable, with George Will, Democratic strategist Donna Brazile, Peggy Noonan of the Wall Street Journal and New York Times columnist Paul Krugman. And as always, the Sunday Funnies. DAVID LETTERMAN, TALK SHOW HOST: Congress passed the health care reform bill. Well, that was easy. TAPPER: Good morning, everyone. Thank you so much for joining us. We are joined now by senior adviser to the president, Valerie Jarrett. Valerie, welcome to This Week. JARRETT: Thank you, Jake. Good morning. TAPPER: Good morning. I want to get to the president's big accomplishment in a second, but first, front-page headlines right now about Iran. What can you tell us about the reports that Iran is suspected of preparing to build two nuclear sites, defiantly against international law, and what is the Obama administration prepared to do about it? JARRETT: Well, what I can tell you is what the president has said consistently, which is that we're going to continue to put pressure on Iran. The fact that the president and Russia are about to sign the START Treaty is a good sign that we're making cooperation and good progress with countries such as Russia. We're going to have a coalition that will really put pressure on Iran and try to stop them from doing what they're trying to do. TAPPER: You're talking about we're going to have a coalition that will do that. The President Obama set a deadline for President Ahmadinejad of Iran of the end of 2009. We're now about a quarter of the way through 2010, still no major international cooperation putting pressure on Iran. You know a little bit about Iranian culture. Don't you think that this in some ways conveys weakness or the inability to rally international support? JARRETT: Quite the contrary. In fact, over the last year, what we've seen, when the president came into office, there was a unified Iran. Now we're seeing a lot of divisions within the country, and we're seeing steady progress in terms of a world coalition that will put that pressure on Iran. So no, I think that we have a strong force in the making, and Iran will back down. TAPPER: When are we going to see sanctions in the United Nations? JARRETT: Well, we'll see. As I said, we have a START Treaty that's good progress. We have a number of countries, 44 countries coming to the United States at the request of the president to focus on nuclear proliferation, and as we begin to forge those relationships and they strengthen, that will enable us to put the pressure we believe is necessary on Iran. TAPPER: OK. Turning to the president's big achievement of the last week, health care reform. Let me show you some numbers from today's Washington Post. Indicates that 50 percent of the American people oppose this new law; 46 percent support it. Those can't be numbers that you're happy about for the president's major domestic legislation. JARRETT: Well, look, the fact of the matter is, this has been a long and challenging process. There has been a lot of negative rhetoric that we've heard around the country. But what we are sure of is that this is as the American people begin to understand what's in this package, when they begin to see the benefits, when small businesses are able to take tax deductions and hire new employees as opposed to having to struggle to make ends meet; as mothers who have children with preexisting conditions are now going to be covered and not be discriminated against by their insurance companies; as we begin to put in more practices so that the premium costs don't escalate and the out-of-pocket costs come down; not to mention the enormous way that we're going to bring down the national deficit as the result of health care reform, we are confident that the American people will support this. It's good for them. As you go around and you start talking about the individual components of this bill, we're seeing overwhelming support. TAPPER: Let me show you some other numbers, because in recent days, some companies have announced they're going to have to take significant write-downs because of the new health care law, specifically the change in what companies can deduct because of the Medicare prescription drug benefit. AT&T says they're going to have to take down a write-down of $1 billion. Deere & Company, $150 million. Caterpillar, $100 million. 3M, up to $90 million. AK Steel, $31 million. Are you concerned at all about the impact this could have on job creation? JARRETT: No, and let me tell you why. And I'm glad that you brought it up. First of all, what they're going to have to write off is nothing compared to the enormous financial benefits to those very same companies by health insurance reform that will bring down their costs substantially. The Congressional Budget Office says so, as well as independent consultants that have been hired by the same companies that you just mentioned. But let's talk about what that is, exactly. Companies are allowed to deduct the amount that they spend on prescription drugs. So if you spend $100, the company does, they're allowed to deduct it. In 2003, Congress passed a law that said we're going to provide a subsidy to those very same companies 28 cents on the dollar for every dollar that they spend, but we still allow them to deduct the entire dollar. And so what we're saying now is that you're not going to be able to both take the 28 cent subsidy from the federal government and deduct the entire amount. And so, I think it's fair. And I think if you look at the other ways that they're helping business, there's going to be a $5 billion pool for reinsurance. We're taking a number of measures that will dramatically reduce the cost of business. So on balance, business will come out way ahead, and that was one of the president's objectives. And the final point on this is we had many conversations with the Business Roundtable, a group that represents the 200 largest companies in the country. They said, look, would you mind if you -- could you push it back another year so that the effective date is in 2013, not '12? And we did that. But keep in mind, where I come from, a billion dollars is still a lot of money, but the fact of the matter is, AT&T is -- that's the amount that is calculated that they would pay beginning in 2013 over a three-year period. TAPPER: OK, this is a very large and bold and wide-reaching piece of legislation. And obviously, CBO, the Congressional Budget Office and others, can predict what's going to happen, but we don't really know what's going to happen. Is the president willing to go back and fine-tune or change parts of the legislation if there are side effects, if there are things that don't work out the way we want them to work out? JARRETT: Well, look, let's try what we've put in place. As a past practice, the Congressional Budget Office tends to be very conservative, and usually the cost savings are even greater. But as with any big piece of legislation, down the line, if we want to make refinements and be flexible, of course. JARRETT: But I think a lot of hard work has gone into this plan. It's been an arduous process. The president has listened to all voices. We have made numerous improvements to the plan as a result of that process. Now let's let it work. TAPPER: In the wake of the health care reform legislation, there have been threats of violence and some acts of violence against members of Congress. And in this fund-raising solicitation I want to ask you about -- this is from the president's political arm, Organizing for America -- used to be Obama for America -- Mitch Stewart, the director, writes in this fund-raising solicitation, "A conservative blogger posted the home address of Congressman Tom Perriello, urging Tea Partiers to drop by. Other members have had death threats. Democratic offices have been vandalized. Please chip in $5 or more to defend health reform and those in Congress who fought to make it possible." Obviously, those threats and the acts of violence should be condemned, they are not appropriate. But is it appropriate for Democrats to try to raise money off of those threats? JARRETT: Look, let's go back to the threats for a second. I think that what's great about our country is that we're able to have an open and free debate about issues and ideas, and once a decision is made, we always come together and move forward. And what the president is interested in doing is moving forward. TAPPER: Right, but what about trying to raise money off of the threats? Is that appropriate? JARRETT: You know, I can't comment on what the political arms are doing. What I can tell you is where the president is and what the president is interested in doing is moving forward with our next challenge. Health care was a huge accomplishment, but we still have many challenges ahead of us. We signed a jobs bill last week. That's really important, to provide tax credits to small business. We now have the president will be signing as a result of the reconciliation bill for health care and education, providing help for kids to go to college. We want to increase the number of children who are able to graduate from college, and funds for teacher training and for community colleges and enabling our kids to get scholarships. There are so many important things, not to mention regulatory reform. So I think the president's view is, let's be positive, let's move forward, and let's improve our country. TAPPER: We only have time for one last question. I want to talk about the tensions with Israel that have emerged in the last few weeks. President Clinton perhaps came closer than any other president when it came to bridging the divide between the Israelis and the Palestinians, and he said this about negotiating peace between Israel and the Palestinians. He said, "The first time I met Prime Minister Rabin after I was elected president, I told him that if Israel would take risks for peace, America would do everything in its power to minimize those risks. Well, Israel has and we have done our part. We have built a bond of trust with Israel and its people that has given it the confidence necessary to make peace." Does that bond of trust exist between President Obama and Prime Minister Netanyahu? JARRETT: Absolutely. Absolutely. The United States is a strong and ardent ally of Israel. The fact of the matter is that friends can disagree, and I think what's important is that world leaders are able to sit down with one another, have frank conversations and move forward. I don't think there is any doubt in the mind of Bebe Netanyahu about the president's commitment to Israel and its safety, and how important it is for the United States and for the region. TAPPER: All right, Valerie Jarrett, senior adviser to President Obama, thanks so much for joining us. TAPPER: And while health care reform is written and signed here in Washington, D.C., it will become reality out in the states. And we're joined now, from the states, from Jackson, Mississippi, by Governor Haley Barbour and Pennsylvania Governor Ed Rendell joins us from Baltimore. Gentlemen, welcome to "This Week." RENDELL: Nice to be here, Jake. requires everyone to get health insurance. His state attorney general is a Democrat, and it's unclear whether or not he's going to go forward. state is going forward with a lawsuit. legal experts think that this lawsuit is folly. We asked the former solicitor general for President Ronald Reagan, Charles Fried, what he thought about this lawsuit, and here's what he had to say. CHARLES FRIED, FMR. U.S. SOLICITOR GENERAL: Anybody who proposes something like this is either ignorant -- I mean, deeply ignorant -- or just grandstanding in a preposterous way. It is simply a political ploy and a pathetic one at that. TAPPER: Now, Governor Barbour, I think that's stronger than even Governor Rendell would say. TAPPER: What is your response to the former solicitor general for Ronald Reagan? BARBOUR: The solicitor general that needs to quit sugar-coating it. No, the fact of the matter is this is an issue that is under our Constitution, where the powers of the federal government are limited; does the federal government have the power and authority to require, force every citizen to buy a product, in this case health insurance? insurance; you must buy a product that has been approved by the United States government, and the price of that product will be fixed by the United States. have to buy a gun. TAPPER: Governor Rendell, your response? RENDELL: Well, the solicitor general is absolutely right. This is a frivolous lawsuit. It's a waste of taxpayers' dollars at a time when all the states are fighting to preserve those dollars. scheme and it's necessary to do so. that is if everyone goes into the insurance pool. It's easily within the power of the federal government. These lawsuits are frivolous. TAPPER: So, Governor Rendell, I want to ask you a question. One side effect of expanding insurance coverage to so many millions of Americans at once is that the system is unprepared for it; there simply aren't the doctors; there simply isn't the infrastructure. And in fact, after Massachusetts passed its health care bill, new patients now have to wait 44 days to see a primary care physicians, and only 44 percent of internists are accepting new patients. How are you going to sell that to Pennsylvanians? RENDELL: Well, first of all, there's a phase-in. The mandate doesn't occur right away, as you know, Jake, so there's a phase-in, and there's time to build up, number one. Number two, an important part of this bill is increasing payments under Medicaid to primary care physicians. We're going to create more primary care physicians. And in this bill, were' also empowering nurses. A certified nurse practitioner can do a lot of things that a primary care physician can do. So the phase-in was very important here. There are some thing that happen right away, some benefits. No kids can get denied for pre-existing conditions as of September. he had a pre-existing condition. That stuff is over. Kids who are 26 years of age or younger living at home, like a lot of our kids are who can't get jobs -- they're going to get coverage. High-risk pools -- I've got 140,000 Pennsylvanians who can't get coverage now because they're seriously ill. They'll go into immediate high-risk pools. So there's a phase-in for some things, but the things that are really important in insurance reform happen very quickly. TAPPER: Governor Barbour, I don't want to pick on Mississippi, but I should point out that studies indicate Mississippi is last in the nation when it comes to health care, when it comes to access, quality, costs and outcomes. Your state ranks worst in the country for obesity, hypertension, diabetes, adult physical inactivity, low weight birth babies. It has one of the highest rates of infant mortality. You've been governor for six years. I'm wondering, what's your response to critics who say that this is probably -- this lawsuit is probably not the best use of your time when it comes to health care for your citizens? is some people think nothing matters unless the federal government requires it by law. Now, a lot of states, like my state, have made real progress here. Our friends at Utah in two years have more than 40,000 people on the health insurance exchange. The president wants us and demands in this policy -- in this law, that we all have health insurance exchanges. We were in the process of putting one together in Mississippi, except now we won't be able to do it like Utah. We're going to have to do it more like Massachusetts, because the federal government says you not only have to have one, you've got to do it the federal government's way. We don't believe that's right for every state. Marshall poll from your state says that Pennsylvanians view President Obama, more of them, unfavorably than favorably for the first time. No offense, you're not doing much better. Democrats in the Keystone State have a tough road ahead of them. Doesn't this bill hurt their chances in November? of the bill and of the president himself. I think that you will find that that's what this will happen as we roll out. of the prognosticators are foretelling. BARBOUR: Well, in fact, I think Ed's got it just backwards. You mentioned to Valerie Jarrett, we've now learned that big corporations are going to have to take $14 billion worth of write-offs, according to the Towers Watson (ph) estimate, $14 billion worth of write-offs that nobody knew about, and that's how many jobs are those $14 billion of losses on corporate balance sheets, how many jobs are they going to cost? We're going to learn a lot more about this deal. We're learning already where they said that small businesses that didn't cover their employees would have to pay $750 per employee. Now it turns out when you read the bill, if you have the average employee in Mississippi who makes $32,000 a year, if the cost of health insurance is more than $3,000 for that employee, the small business will have to pay $3,000, not $750, four times as much. elite, and every day that goes by, it gets sloppier. 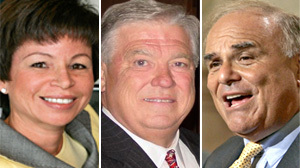 RENDELL: -- because it's getting pounded in the media. A lot of the media is pounding the bill. turn out to be surprising on the negative side. There are a lot of terrific things on the positive side, as Valerie Jarrett so aptly put it, and we're finding out in states, there are a lot of good things in the states here, things that help us financially as well as the things that cause us extra burdens. America like none we've seen in the last decade. TAPPER: OK, we only have a couple of minutes left. And I would sued for journalistic malpractice if I didn't ask you two political animals a couple of political questions that don't necessarily have to do with health care reform. Governor Rendell, I'll start with you. Your colleague, David Paterson, from New York, it's hard to look at his gubernatorial ship right now and think it's anything but a disaster and hurting Democrats in New York and perhaps even nationwide. Should he resign? RENDELL: No, first of all, Andrew Cuomo is going to get elected governor of New York here, regardless of anything that's going on, because he's a great public servant. But Dave Paterson's got, like Haley, like I do, about eight or nine months left, and I think there would be more havoc if he stepped down. The lieutenant governor right now wasn't elected. David Paterson and the people around him I think are OK to finish the term. TAPPER: Governor Paterson wasn't elected either, but moving on to Governor Barbour, I'll ask you a question. RENDELL: He was elected lieutenant governor. He was elected lieutenant governor. your colleague from -- your former colleague from Louisiana, and John Ensign, does that hurt your party's ability to claim the mantle of family values, and does it hurt your ability to tar the Democrats as being part of a culture of scandal? BARBOUR: Well, I'll just say, I think David Vitter will be reelected this year by the people of Louisiana because he's a good, solid conservative who votes the positions that the people of Louisiana want. I'm not as close to Nevada, but Senator Ensign is not up this year anyway. I can't help, though, but not go back to something that Governor Rendell said. Ed and I are good friends, seriously, but the idea that the CBO has scored this bill to say that it's going to reduce the deficit is one of those things that the news media has helped the administration cover up. In the next few weeks, we're going to pass -- the Congress is going to pass a law that increases by about $220, $230 billion what we pay physicians under Medicare. with it, this is not a deficit-reducing health care bill, and people ought to tell the facts about it. TAPPER: Governor Barbour, Governor Rendell, that's all the time we have. We're over time in fact. Thank you so much for joining us. Enjoy your Sunday. The roundtable is next with George Will, Donna Brazile, Peggy Noonan and Paul Krugman, and later the Sunday Funnies. UNIDENTIFIED MALE: Violence and threats are unacceptable. They have no place in a political debate. REP. NANCY PELOSI (D-CA), SPEAKER: Some of the actions that took place must be rejected. UNIDENTIFIED MALE: I hope you die. REP. ERIC CANTOR (R), VIRGINIA: Enough is enough. It has to stop. We need to move forward and get back to addressing the important issue facing our nation and let law enforcement handle these situations. TAPPER: Some of the uglier repercussions from the health care reform vote. And joining us to talk about that and all the week's politics, as always is George Will, Peggy Noonan of "The Wall Street Journal," Paul Krugman of "The New York Times" and Democratic strategist Donna Brazile. Everyone, thank you so much for joining us. George, we're going to start with you. This is a big win for President Obama, isn't it? GEORGE WILL, ABC NEWS CONTRIBUTOR: Huge. It expands the dependency network in the country, which I think is the Democrats vocation, certainly changes the relations between the citizen and the state, more than anything since Medicare 45 years ago. But it also reminds Americans why they more often than not produce divided government because they like to see the government not take such giant steps. Furthermore comes after the stimulus, it comes after TARP, after General Motors and Chrysler, so it's part of a pattern that is worrying a lot of people. And furthermore now that insurance companies are going to be essentially public utilities, now that the Obama administration owns the health care system, every disappointment with that system and their constant in a complex system is going to be laid at their doorstep. So I think this will be a poison chalice. TAPPER: Wait Donna, that's not what I had in mind when I said this is a big victory for President Obama. What is your take? DONNA BRAZILE, DEMOCRATIC STRATEGIST: Well, it's a victory for the American people. It's a victory for the uninsured, the underinsured and those with insurance. It saves lives, saves money, extends the life of Medicare. So I think this is a victory for the president. It's also a victory for the House Democrats, as well as Senate, and demonstrating that they can govern, they can get something big, and something complicated done. TAPPER: Peggy, Republicans are talking about repealing it, they're talking about challenging it in court. How realistic are these both as campaign slogans and as actual lines of attack? PEGGY NOONAN, WALL STREET JOURNAL: I don't know. I think it is very interesting that we have debated this bill every day for one year. The president has put forward his case again and again. He just won. It was very close, but he won, and yet, the American people still, according to the polls, don't like this bill. The president, just after his great victory, is forced to come forward and speak now and tell the American people, no, it was really good, you're really going to like this thing. So I do think he is in a difficult position. It seems to me positions are hardened and they have over the past year. The Republican Party and the Democratic Party will be looking at the country and saying, experience now the wonder of this bill. Is it more burden or more benefit? They will be talking to the center, trying to convince the center of their case. TAPPER: Paul, you heard Governor Barbour say that this is not going to reduce the deficit. And you're the only person I know with a Nobel Prize in economics. And I want to put up something that the former director of the Congressional Budget Office wrote in your newspaper, Doug Holtz-Eakin. "In reality, if you strip out all of the gimmicks and budgetary games and rework the calculus a wholly different picture emerges. The health care reform legislation would raise, not lower federal deficits, by $562 billion." PAUL KRUGMAN, NEW YORK TIMES: That was a shameful column on the part of Doug Holtz-Eakin. You can just go through it and see that he made assertions. They're just not true. He's not commenting on the reality. He's commenting on what the Congressional Budget Office was based on. And if you look at the things he said, he says it's 10 years of taxes for six years of benefits. That's just not true. Most of the taxes don't start up until the time the benefits do. That's just wrong. The odds are this is going to actually be better than the CBO numbers say. Because there are things that are uncertain and the CBO scores them as zero because we don't know if they work. But some of them will work. Above all, it's amazing. Think about people on the right. They're simultaneously screaming, they're going to send all of the old people to death panels and it's not going to save any money. That's a contradictory point of view. KRUGMAN: The advisory path has the ability to make more or less binding judgments on saying this particular expensive treatment actually doesn't do any good medically and so we're not going to pay for it. That is actually going to save quite a lot of money. We don't know how much yet. The CBO gives it very little credit. But most of the health care economists I talk to think it's going to be a really major cost saving. I have to say, I'm wearing an FDR tie in honor of the fact that we have gone from the New Deal to the Big Biden Deal, I guess we're allowed to say. NOONAN: Try to read something on your computer. That's complicated. KRUGMAN: A lot of people are saying Romney care has just passed. This is essentially identical to the Massachusetts health reform. There are really no significant differences. We know it can be worked. Massachusetts, you know, there are problems with it, but it's not an unworkable system. This is what legislation looks like. I do international trade stuff. Somebody should look at a trade agreement which typically runs at 23,000 pages. This is nothing much. WILL: First of all, Paul's prizes in economics not practical Washington wisdom. No one that I know, Paul, thinks the Cadillac tax that's been kicked down the road on the expensive health care plans until 2018 will ever be enacted. No one thinks the Medicare cuts are ever going to be enacted. One of the ways this simple workable legislation is going to be made to work is the IRS is going to hire about 16,000 new agents to chase the American people around to make sure they pay their mandatory fees. One half, approximately one half of the 35 million or so people who previously uninsured who are not going to be uninsured, are going to go on, the Medicaid of rules of our overburdened state governments. All of that cost will be pushed down into property taxes. This is going to have unintended consequences that will boggle your mind. BRAZILE: I think we're going to spend the next six months once again trying to debunk all of these myths and these lies and this misinformation that's been floating around on the Internet over the last couple of years. The truth is that this is a strong bill that will provide relief, not just to those individuals without insurance, but those individuals with insurance who announced the premiums rise, by 25, 39 percent. They're also concerned that they are one flu away or one sickness away from losing their health insurance. And yes for small businesses, this will give many individuals an opportunity to finally be able to afford health care. There are so many good benefits. If we start cherry picking apart all of the bad things and then exploit some of the anger and frustration out there, then we'll continue to have another six months of conversation to put out all of the lies and all of the rumors. TAPPER: It's better than not completely insane. It's an astute point. If you look at Washington politics, these tough decisions often do get kicked down the road until they are kicked away completely. If you look at the Medicare doc fix, how much doctors are supposed to be reimbursed. That was done as cost saving and then they keep undoing it. And the question is if these Medicare cuts to Medicare advantage, and if these taxes, on these high so-called Cadillac tax, if these will actually be enacted or not. And Paul and Donna, do you think that will actually happen? KRUGMAN: The actual history, most Medicare cost-saving measures have in fact gone through as planned. So if people cherry pick a few that have not and say, oh, you can't actually do anything. But the history is in fact that most of them have in fact been implemented and not reversed. So the history is actually on our side here. And look, the fact is that these things, like the Cadillac tax, they are going to be coming up at a time when we'll be very much in. Now we need to get the budget under control mode. The fact of the matter is, the timing is such that just about the time that we're saying, OK, we ran up big debts to deal with the great recession, now we have to do something to get the fiscal balance under control. That's exactly when the Cadillac tax is going to come along and people are going to say, oh, we're not go to do that, then they'll be forced to come up with something else. So I actually think this is all going to happen. I think it's -- if anything, there are going to be more cost-saving measures down the road because look, we are -- we do know that by 2018, 2020, fiscal issues are going to be at the forefront. So I don't think this is at all implausible. The logic of the situation says that the petty politics is actually going to be pushed into the background. TAPPER: George and Peggy, let me ask you a question. One of your fellow pundits, David Frum was summarily dismissed from his position at the American Enterprise Institute. Why he was, we're not going to get into, but it occurred after he wrote a column that I want to ask you about. He said that the passage of this bill was actually a waterloo for Republicans. He wrote, "No illusions please. This bill will not be repealed even if Republicans score a 1994 style landslide in November. How many votes could we muster to reopen this donut hole and charge seniors more for prescription drugs? How many votes to re-allow insurers to rescind policies when they discover a pre-existing condition? How many votes to banish 25 year olds from their parents insurance coverage? We followed the most radical voices in the party and the movement and they lad us to abject and irreversible defeat." Peggy, did Republicans squander an opportunity here? Whether or not you look at short-term gains that could happen, this bill is likely not going anywhere. Should Republicans have gotten up to the table and actually tried to contribute ideas? NOONAN: A lot of Republicans feel they did go to the table and were not so terribly welcomed there. You all know the stories. Olympia Snowe tried it. Paul Ryan tried it. Tom Coburn, Bob Bennett. There are a million names of people. Bennett had a Bennett-Wyden bill that was so good, had the support of Republicans and Democrats, covered so many people. The administration and the Democratic-controlled Congress just stiffed it. KRUGMAN: I wish I lived on Peggy's planet here. NOONAN: Too far in the directions that they didn't want to go. They didn't want public option, et cetera. Widen-Bennett was good. WILL: The Wyden-Bennett bill, if the president had come out right after his inauguration and said, I want to do two things, I want to change the tone in Washington and I want to insure the uninsured. By last August, he could have had that passed and the Wyden-Bennett bill with 70 votes. It's one-nineteenth the length of the bill that was passed. It's less intrusive and less coercive, which are virtues to some of us and vices to the Obama administration. KRUGMAN: ... which means that whatever people said about supporting it, as it came closer the floor, it would have had mass defections. The Obama -- "Obamacare" is conservative, not in a political sense, but in a sort of ordinary life sense. It leaves the system that most Americans have pretty much intact. And that was what made it possible. You can say in the abstract, oh, people were in favor of the ideas behind a radical transformation of the whole system. It wasn't going to happen. This was going to happen and it did. WILL: Well, I agree with Paul to this extent, that the Obama bill is fundamentally timid in that it did not attack what everyone knows is the source of our main problem, which is employer-provided health insurance, which tangles up a high inflationary product, health insurance, health care with the wage system in this country. KRUGMAN: I guess I'm not everyone, because I don't agree. I mean, the fundamental problem we have is third-party payment, which is necessary. You can't run health care unless somebody pays -- else pays the bills in extreme cases, which is where most of the money is. But we don't have a system that is very good providing incentives to limit costs. And this bill takes some important steps in that direction. TAPPER: But I want to move on to another topic. TAPPER: Donna, do -- yes, go ahead. BRAZILE: David Frum, because Dave is a good person. It once again shows that this -- the Republican Party has a small tent, that they are not diverse and they are not welcoming. And I think it's bad for the parties. Good for Democrats, though. TAPPER: I just want to switch -- I want to switch topics for one second, Peggy, because this is a lot on health care and we have a lot to talk about today. But I do want to make one point and that is, the Wyden-Bennett bill included an individual mandate, which is what all of these states are suing the Obama administration over. It included an individual mandate. BRAZILE: That was a Nixon idea. TAPPER: Because there's some good politics going on right now. Over the weekend, former Alaska Governor Sarah Palin was out there stumping for her former boss, Senator John McCain in Arizona. We talked to some of the people who attended these two rallies. And here's what they had to say. UNIDENTIFIED MALE: I came here to see Sarah Palin because she totally rocks. UNIDENTIFIED FEMALE: I am supporting J.D. Hayworth. UNIDENTIFIED FEMALE: I wanted to see Sarah. I heard most of her speech in there. I didn't agree with a lot of it, because we don't support John McCain. I'm supporting J.D. Hayworth. TAPPER: J.D. Hayworth is, of course, the Republican challenger to incumbent Senator John McCain. George, you were out in Arizona with J.D. Hayworth a few weeks ago. What did you see? WILL: He's a large, loud former sportscaster with a flair for rousing the rabble. And he's a former congressman, so he's not new at this business. In January, the Republican Central Committee in the state of Arizona voted to close the primary, which is their right to do, associational right. You can say Republicans -- only Republicans will pick Republican leaders. But that was a fundamentally hostile act to John McCain, whose strength is not with the Republican Party, but with independents. So this is going to be a race. TAPPER: Peggy, is Sarah Palin doing any good for John McCain out there? NOONAN: Yes. And that over 30 years he has lost. However, the very tea party itself, this is a rising up of people who have not always previously been in politics. There are a lot of women in it, a lot of activists. They are going -- they are perhaps part of a reconstituted and changing -- ever-changing big tent. I don't happen to see the -- the conservative movement as becoming a smaller tent, but I do see, I think, sometimes a tendency to forget that conservatism, apart from being a great political philosophy, has within it the spirit of a rebellion. Sometimes, lately, it seems to take on the spirit of an orthodoxy -- do you know what I mean -- and of a strict ideology. That is not a good thing. Let a thousand flowers bloom. KRUGMAN: Not lately. It's been pretty much a rigid orthodoxy for quite a long time. But, you know, the interesting thing is this is John McCain, who, you know, built his reputation, became beloved of talk shows like this one as the great maverick now being forced to do a pretty good imitation of a doctrinaire, die-hard, no-flexibility, right-wing Republican, because that's the only way he can survive. And that's telling you something has happened to the party. There is no room in this party for the John McCain of 10 years ago, no room for people who express a different point of view. TAPPER: Donna, does the fact that McCain's in trouble show that the maverick positions he did take in the past -- not 10 years ago but even a few years ago, such as immigration reform, or even last year or 2008 on the Wall Street bailout, that he is no longer representative of the Republican Party, or is it just -- or is he just an old -- is he an anachronism, something -- a more moderate Republican? BRAZILE: Well, I think John McCain is being John McCain, and that is, he is trying to survive a very heated, difficult and perhaps, you know, energized Republican primary. I was at the Republican Convention, and what struck me when Sarah Palin came to the floor is that she energized a four-car funeral. She's trying to bring some energy and some life to John McCain. And I don't think that's, for her -- I mean, for him, it's a good thing, but for the Democrats, I don't think it hurts us at all to have Sarah Palin out there, whipping up the base, whipping up the tea parties. Stir up as much tea as you want. It's producing a lot of coffee drinkers within the Democratic Party. NOONAN: Sometimes I feel that we all forget the big center that doesn't show up in politics all the time and isn't always that politically engaged but is watching and shows up to vote. TAPPER: We only have time for one topic. And I want to throw out the fact that this has not been the greatest month in the history of U.S.-Israel relations. Paul, was this conflict, the showdown with Netanyahu -- was this inevitable? KRUGMAN: I think so. Actually, my colleague Tom Friedman had a good thing to say about that. He said that it used to be that making peace was -- you know, was an important job for Israel and, sort of, a hobby for the United States. And now it seems to be the other way around. The United States has huge interests in reaching some kind of solution to the Israel-Palestinian problem. Israel no longer seems particularly interested in it, or at least the current governing coalition in Israel doesn't seem interested. So, sure, there's a big tension, and this is the problem. And, you know, I think Netanyahu isn't in control of his own coalition. I mean, I don't think it was a deliberate, top-down decision to start new housing developments in Jerusalem right at that most sensitive moment. It's his own -- it's his own junior partners who are out of control there, and this is a problem for Obama. It's a problem for America. WILL: U.S.-Israeli relations are worse now than they have been in the 62 years that Israel has existed. It's the only nation in the world with which we have worse relations. What nation is that? It's the only democracy in the Middle East, the only salient of our values in that inhospitable region, the only reliable ally there. And we are treating it as a problem because the Jews in a Jewish section of Jerusalem have decided to builds 1,600 housing units. It is the law of the land, expressed in the 1995 Jerusalem Embassy Act, that Jerusalem shall be the united capital of the state of Israel, period. BRAZILE: Well, our -- the bond is still strong between the Israeli people and Americans. I think the relationship is rocky now. But long term, the Obama administration is clearly committed to a safe and secure Israel, but they also would like to see the Palestinians and Israelis come back to the table. WILL: Out of the way -- the Obama administration's position is that we will be used by the Palestinians as the intermediaries in proximity talks, make the Palestinians talk to the Israelis. TAPPER: All right. Well, we're going to have to continue this discussion in the green room. The roundtable will continue that on abcnews.com.